Another lackluster performance from the Packers. We can only hope that the September swoon that has engulfed the Brewers has not ventured northwards into Green Bay. Here’s a look at some of the numbers from Sunday’s loss to the Lions. 1. Seven points. The Packers scored a TD in the first quarter and then were shutout the rest of the game. * It was the 70th time since 2000 that the Packers had only seven points at halftime. They are 29-40-1 in such games (.421 winning percentage). * It was the 31st time since 2000 that the Packers had only seven points starting the fourth quarter. They are 8-22-1 in such games (.274 winning percentage. * It was the 91st games in the Super Bowl era (since 1966) that the Packers scored seven or fewer points in a contest. They are 1-90 in such games. Their only win when they scored seven or fewer points was September 17, 2000 when they defeated the Philadelphia Eagles 6-3. 2. No field goal attempts. Placekicker Mason Crosby did not attempt a field goal in the game. It was the first game since Week One of 2013 against the 49ers that has happened. 3. Three or more takeaways. Getting three or more takeaways is usually a good sign for the Pack. They had three in yesterday’s game (two interceptions and a fumble recovery). Since 2000 the Packers are 59-9 (.868 winning percentage) when they have three-plus takeaways in a game. Unfortunately, a bad trend is starting: Green Bay has now lost three straight when they have three or more takeaways in a game. 4. Held Lions under 20 points. It was the 100th time since 2000 that the Packers held the opposition to less than 20 points. They are now 87-13 in such games (.870 wining percentage). They had won eight straight games (before yesterday) when the defense held the opponents to less than 20 points. 5. A combined 26 points in the game. 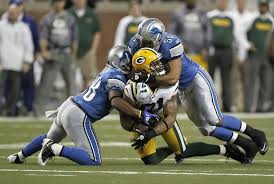 The 26 combined points was the lowest in the Packers-Lions series since December 12, 2010 when the Lions won 7-3. 6. Shutout in quarters two through four. The Packers scored in the first quarter and then were shutout in quarters two, three and four. It was the first time this has happened since December 19, 2005 when the Pack scored a field goal in the first quarter and then were held scoreless the rest of the way in their 48-3 loss to Baltimore. It was the 21st time this has happened since 1966. 7. Rodgers with 162 yards passing. Rodgers had less than 170 yards passing in games he started for the fifth time in his career. The Packers are 0-5 in those games. 8. Lions return fumble for TD. This was the 42nd time since 1966 that the Packers opponents returned a fumble for a TD in a game. The Packers are now 9-32-1 in such games (.226 winning percentage). 9. Packers had 223 yards of offense. It was the 12th time since 2000 that the Packers had less than 225 yards of offense in a game. They are 4-8 in those games (.333 winning percentage). The last time it happened prior to yesterday was last year in Detroit when the Packers had 126 yards of offense in their 40-10 loss to the Lions in Detroit. 10. Packers had two interceptions. Prior to yesterday the Packers had won 22 of their last 23 games when the defense had two or more interceptions in a game. They are now 71-13 since 2000 in such games (.845 winning percentage).